I make a distinction between 'recurring' or 'residual' commissions, and 'lifetime' commissions. An affiliate program paying residual commissions pays you every time the customer renews their subscription to a specific product, not just for the first purchase. An affiliate program paying lifetime commissions pays the affiliate a commission for each and every product that the customer buys from that merchant, including residual commissions, if applicable. For example, let's say that you are earning recurring commissions on Mr. Samson's web hosting subscription at Best Host Company. If the company doesn't offer 'lifetime commissions' and Mr. Samson upgrades to his own dedicated server at Best Host Company; you won't get paid commissions on his monthly server fees because it's a different product. If XYZ Company offers 'lifetime' commissions however, the customer you refer to them is "yours" for life, regardless of which of Best Host Company's products they buy. In the scenario above, you would now be paid a monthly commission on the dedicated server fees for as long as Mr. Brown remains a subscriber. The value of both residual and lifetime commissions increase over time. As the number of your sales grows, your residual commissions will continue to increase. 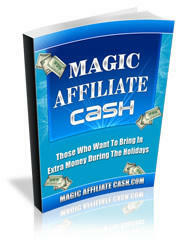 Super Affiliate Handbook you take a vacation from your affiliate business, the checks for your residuals, will keep coming in. How many other businesses pay you to take a vacation?